DuPont ISCEON MO99, also known as R-438A, is an environmentally friendly alternative to the original hydrochlorofluorocarbons (HCFCs) R-22 refrigerant. However, the advantages of MO99 span more than just environmental goals. Below are 10 reasons Dupont MO99 is the best R-22 replacement option. 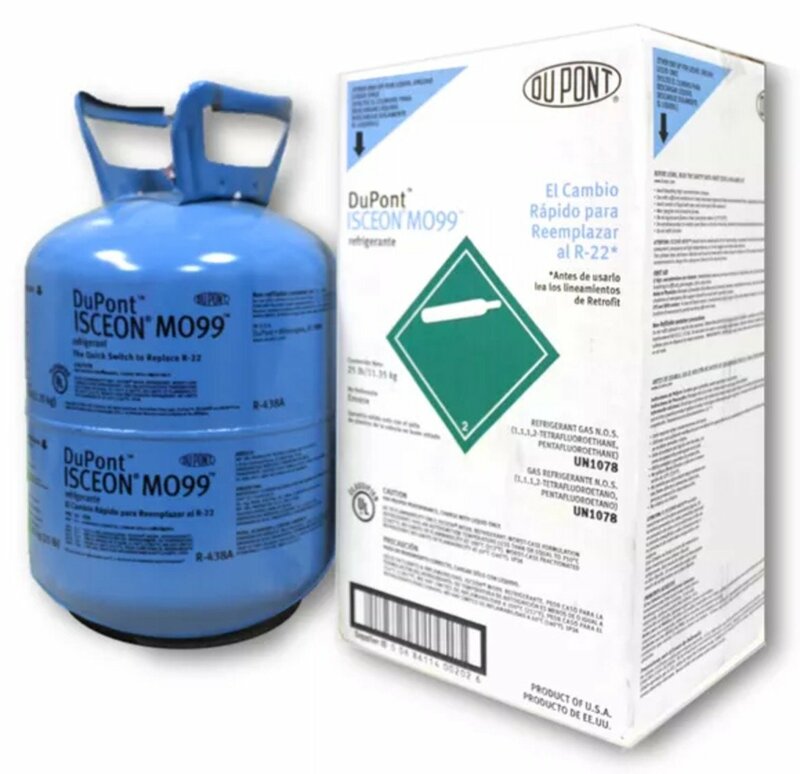 Refrigerant Depot is a wholesaler of the DuPont MO99 product and we offer some of the most competitive prices in the industry. 1. MO99 refrigerant is better for the environment. Due to ozone depletion, R-22 refrigerant is being phased out of production to allow for the availability of more sustainable coolant products. DuPont MO99 is a non-toxic hydrofluorocarbon blend with a zero ozone depletion potential (ODP). There is no need to replace costly equipment when performing a retrofit on existing R-22 systems as MO99 refrigerant has the best compatibility with existing systems. 3. The MO99 option is time efficient when performing the retrofit. Replacing the R-22 components is no more time consuming than recharging the original system. The cooling capacity and power consumption of DuPont’s hydrodluorocarbon blend has been shown to be similar to that of R-22 if not just as efficient. MO99 has a reduced discharge temperature in comparison to R-22, which may extend the life of the compressor. With less than 3% hydrocarbons, the flammability risk is minimized under normal circumstances. Further, the refrigerant has an ASHRAE A1 safety classification, which means it is nonflammable and low toxicity. This refrigerant is compatible with both customary and artificial lubricants (mineral oil, alkyl-benzene (AB), and polyolester (POE) are all acceptable), eliminating the need for the oil to be changed. This saves time, labor, and cost. Retrofitting systems with MO99 provides the equipment owner with a cost effective alternative to recharging with the significantly more expensive R-22. In addition, because MO99 is compatible with mineral and polyester oils, it reduces costs by eliminating the need to change the existing oil to accommodate a different refrigerant. Not only can the DuPont product be fitted to commercial and domestic systems, it can also be used to retrofit R-22 heat pumps. 10. MO99 is field proven. Hundreds of thousands of commercial and domestic systems have been retrofitted to MO99 with successful results. Rest assured that when purchasing from Refrigerant Depot you are receiving exceptional customer service, quality products, and the most competitive prices, but you are also only purchasing products manufactured in the USA. With Refrigerant Depot’s refrigerant buy back program and service options to both residential and commercial customers, keeping your surroundings cool could not be easier.